Grab Raw Food Health With Both Hands! This balanced healthy eating guide will help you achieve better health, natural beauty and stronger energy flows through raw food health. Jumping into a 100% raw food diet isn't for everyone... but raw food health can grow on you. Growing Raw's healthy eating guide is here to help you find your way to healthier eating habits. Many raw foodists speak of reaching superhuman levels of health, clarity and energy once they embark on a raw food diet. You too are capable of more than you know once you find better health and feel stronger energy flows. Increasing the amount of raw vegetables and fruit you eat to even 50% of your diet can supply you with amazing returns. Once you reach the 50% goal, your enhanced health can inspire you to travel further onwards to 60%, then 70%. Once you accomplish the goal of 80% raw food health your diet is known as high raw. The heights of high raw are well worth striving for. So come along with the Growing Raw Healthy Eating Guide and find out how to up your intake of raw vegetables and fruit and boost your energy and health beyond your known limits. It’s worth making time for healthy eating. Consider it an investment in your body’s future. If you don’t maintain your body’s energy and immunity levels you leave yourself vulnerable to exhaustion and illness. Make healthy eating a habit and advance towards optimum health, vitality and natural beauty. Sustaining a high raw lifestyle becomes a broader consideration that can include growing your own food, eating more organic produce, choosing a completely vegetarian or vegan diet, experimenting with healthy food recipes and sharing healthy eating habits with your family and friends. Grow your own healthy food and learn how to harvest raw food health from your home vegetable garden. You’ll rejoice in consuming your own delicious home-grown produce. When you grow your own organic fruit and vegetables, you’re also being kinder to the planet. You can become more connected to the food cycle and find a healthier place in it. Develop a healthy relationship to the food you eat, save your budget, have fun gardening and inspire your kids. Work towards a greater food self-sufficiency that will benefit your health and the environment. The More Healthy Food Choices You Make the Healthier You’ll Feel. You're in the right place to start taking care of yourself, your health and the wellbeing of the people and planet you care about. Take the journey one step at a time. From garden to table, Growing Raw's healthy eating guide explains the positive changes you can make. Choose to eat the best food and your body will quickly thank you with a surge of energy and health. Discover fresh and easy ways to gain maximum nutritional power from your home-grown or organic store-bought produce. You'll feel superhuman once your healthy eating habits kick in. 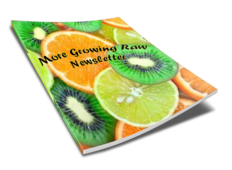 Become a friend of Growing Raw and you'll receive the "More Growing Raw" free monthly newsletter. You'll be updated with healthy eating tips and earlybird news about discounts and competitions from the Growing Raw healthy eating guide. You'll receive your free copies of the "Vegetable Checklist" and "The 5 Secrets to Healthy Snacking." Snack time is when many aspiring healthy eaters come undone, so learn the top 5 secrets for staying on track when the munchies hit. I promise to use it only to send you the More Growing Raw Newsletter. I'd also love to hear about your journey to better health and greater energy. If the Growing Raw healthy eating guide has inspired you to take even the smallest positive step, please drop me a few friendly lines. Check back here for regular healthy eating guide updates and news on Growing Raw. This free e-book offers you fresh ideas and lifts your spirit on your journey to greater health. Boost your health, lose weight naturally and increase your energy levels by building healthy eating habits for life. Veg Up gives you a daily healthy eating plan in workbook format. Burst into raw food health with an organic raw food diet. Need more energy? Feel like a mood lift? Want to give yourself greater mind-power and vitality? Give your body the best food possible. Get the most out of your raw food diet weight loss journey by checking out these efficiency tips. Here are a few things that you should know when you are eating raw food for weight loss. Start with these easy raw food recipes and work your way to gourmet. Enjoy the adventure as you learn and soon you'll be designing your own delicious raw diet recipes. Drinking a green smoothie a day is one of the best healthy food habits you can make for yourself. Learn how to make the healthiest smoothies and get that green smoothie skin glow! Take a look at these fresh and easy vegetable salad recipes and get inspired. Vegetable salads are packed with nutrients and fibre and are a great way to get your daily serve of veggies. My best salad dressing recipes will inspire you to eat salad all day! These raw homemade salad dressings are made from fresh food ingredients and will tempt your tastebuds. Make sure you only spend your money on a good daily healthy eating plan that will help you reach your health goals successfully. 5 easy ways to check healthy food menus have what it takes to help you. Healthy eating plans promise the world, but we all know developing healthy eating habits takes more than a menu. Learn how to stick to your daily healthy eating plan. Here is a healthy and efficient way to cleanse your body using an all natural detox diet. Good food digestion is important so that our bodies can fully absorb nutrients and process vitamins and minerals as efficiently as possible. Give more attention to the way you eat. Welcome to the Veg Up forums! Share your experiences and successes following your daily healthy eating plan. The advantages of organic food are substantial, both to your health and your environment. Empower yourself by choosing to eat organic food and selecting organic gardening methods whenever possible. Home vegetable gardens provide you with the healthiest food to eat. Find here vegetable gardening tips that will help you grow healthy food in numerous productive and creative ways. Growing herbs is immensely rewarding, especially when you know how to use them effectively for medicinal and culinary purposes. In this series of articles, learn how herbs can help you in your home. A good garden kit may be the first step that gets you hooked on growing your own fresh, healthy food. Take a look at the variety of garden kits available. Find inspiration and great vegetable gardening tips in these home vegetable gardener interviews. Share in the knowledge and experience of successful food growers. Controlling temperature, preventing dehydration and minimising damage are the keys to how to keep vegetables fresh. 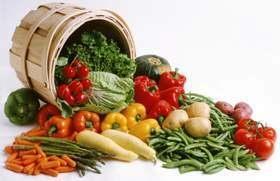 To preserve the highest nutrition, check the following guide on storing vegetables. The best vegetable gardens for kids provide healthy snacks while kids are on the go, as well as opportunities to learn about how food grows. Get your kids eating healthy food. It's important that kids get good nutrition so they can grow and thrive. Read on for tips on getting kids to eat healthy food, kid-friendly information and recipes. I'd love to hear from you, so please send me your comments. I'll reply as quickly as possible. Enjoying this site? Please subscribe for regular updates from GrowingRaw. Get personalised help for your specific healthy eating challenges. This service is a free consult. I'll reply to your questions with healthy eating tips selected especially to meet your needs. The information contained in this website is not intended to replace the advice of your doctor. Click here to read disclaimer for growingraw.com. Healthy eating empowers you to get the full benefit of physical fitness. Having your body fully fuelled enables you to get your best effort when you train. Here are plenty of small garden ideas to help you on your way towards growing your own food and herbs. Work out how to create successful small vegetable gardens both indoors and outdoors. Snack AND lose weight with these 10 healthy snacks for weight loss. Healthy diet snacks can balance your blood sugar and keep your metabolism from crashing. Can a raw thyroid be healthy and balanced? Tweak the raw food diet to stabilise underactive (hypo) or overactive (hyper) thyroid issues. A natural detox diet should leave you feeling lighter, more energised and clear-headed. Which is the best whole body cleanse for your system?